I am one of the few people that can brag about having seen all of the live action star wars movies in the theater. I’m sure my parents had no idea what they were starting when they took me to see Star Wars in 1977. I’m fairly certain George Lucas had no idea what he was starting with the world either. Since then I’ve collected figures. From the cardboard on Christmas morning stating that my figures would soon be arriving, to the re-release in the nineties. I’ve collected. I have even planned for passing the torch or lightsaber as it might be. I collected as a child. I collected as a preteen, and the collected once again in college. I collected for my nephews as soon as they were born. I collected star wars figures for my son before I met my wife. So yes, I have a problem. Fortunately, my wife has accepted me in spite of my flaws. Enough about my backstory and bruised psyche. With all that said, how could I resist Force Friday at Toys R Us? I am excited for the new movies. I have been waiting since I was a senior in high school, when Timothy Zahn wrote Heir to the Empire. Zahn took the characters I grew up with and added to their story. I followed the books through college and still read them today. So, back to the point, I’m excited for the new movies. They may not have anything to do with the books I’ve read, but that doesn’t matter. Even more exciting to me than the movie is sharing it with my five year old. So one week before Christmas, The Force Awakens arrived in theaters. Instead of three months late like A New Hope, the figures arrived three months early. Like Every good geek dad, I got up in the middle of the night Friday morning and stood in line to buy toys. While it was a successful trip in my estimation, I was a bit disappointed. I think I may have figured out a couple of the problems. My first issue was the crowd. More accurately, it was the lack of crowd. I arrived at 11:00 pm. I sat in my car until a quarter until midnight, and was still fourth in line. I understand that the prequels left all of us underwhelmed. (Revenge of the Sith was pretty solid, but George Lucas had done a decent job of lowering our expectations by that point) However, I am actually excited again. Where were the rest of the Star Wars fans? This movie had to be better than The Phantom Menace. J. J. Abrams has already proved himself able to reboot a franchise. He was fair to fans and the Star Trek world in both his films. There’s enough reason for excitement there. So, I a little disappointed I was only among a dozen people or so. My next problem was the selection. I’m an average guy, but I want to complete my collections. I’ve learned over the years there are rare figures. 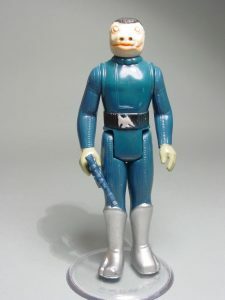 I have accepted the fact that I may never own a blue snaggletooth. What I am upset about is the lack of rare figures, even at a midnight opening. While I ended up being able to get all the figures, it took 5 stores. 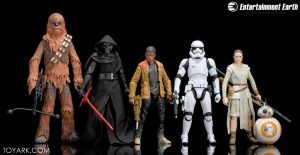 I think if you’re willing to show up at midnight and be fourth in line, then you should have access to all the new figures. My final problem, the choice of characters. I like seeing the new characters, but I have no attachment to them. This collection had a Darth Vader and Luke Skywalker (Bespin). I wanted an older Luke, Han and Leah. We all knew they were in the movie, but no character in this release. C-3PO with the red arm and R2-D2 came out on the 24th, but that is all from the original trilogy. I only know these characters from a 2 minute trailer. Guess I wouldn’t be as upset if I wasn’t emotionally invested. I’m a sucker for Star Wars, either figures or movies. Overall, I was more excited with my purchases than disappointed. I am excited that Christmas was taken care of for my son. He’ll saw his first star wars movie on December 18th, and then got the figures from it on Christmas. I was excited to see the movie, but more excited to see it with him. He’s a little older than I was when I saw A New Hope, but to be able to share this with him is a whole new kind of special.